So, as I've mentioned previously, I'm a pretty lucky guy. You know, getting to try out all these new devices and all. 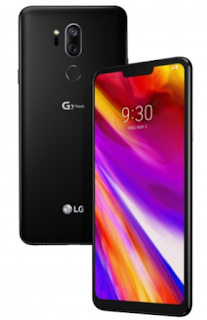 And though I know one of the great things about Android is everyone gets to pick and choose their own style and flavor of phone, I've realized that while there's some cool features that seem to be unique to each device, there's a lot of things that I like more about the LG G7 ThinQ. Yeah, I had to shelf my LG G7 for a couple of weeks, but coming back to it makes me realize even more how much I like this device and why it's my "daily driver". For one, the knock code/knock on feature. I know this isn't restricted to only this device. The LG lineup has had the knock to wake features for a few versions. Still, if you haven't used an LG and you like to exercise THIS feature is a must have. Why? Well... let's say you have your phone in a running waist pouch or an arm band with a window on it. With other phones, the only way to see the screen and wake up the device is with fumbling around to find the power button. I like jogging... and while I have the device set to stay unlocked with my trusted Bluetooth earbuds I set it so the screen shuts after 30 seconds. While jogging I have 'Map my run' going as well as Spotify or Audible. Being able to tap the screen awake to see my distance or pause my run or even change a playlist is key to me. The other device I've been testing doesn't allow this functionality. Back to the sound - you don't realize how great the speaker sound is on this phone until you compare it to another phone. It's night and day. The DAC is great too... I tend to use wired headphones for traveling. Just the fear of my Bluetooth headphones dying on the flight... but I find the sound is MUCH better than my Bluetooth - even with Bose headphones. Speed - apps turn on with speed. No lag, no freeze, no memory issues. The LG G7 ThinQ is just fast! Landscape mode turns apps with precision. Camera Opens up super fast. Even slow to load apps like Skype for Business open faster on the LG G7 than any other device I've owned. Lastly - Familiarity. It's weird - the LG G7 feels new in a lot of ways. Screens look different, the 'notch' looks different the whole thing has a new feel to it... yet, it's natural and comfortable to use. Kind of like slipping into my favorite broken in pair of jeans - dependable, but comfortable. Anyway, I still really enjoy this offering from LG and will be happy to have it back in the drivers seat. I'm still reviewing a couple of other device offerings by 2 manufacturers that I need to run through the paces, but the LG G7 ThinQ is still my go-to. Questions about the LG G7 ThinQ? Thoughts? What do you think about the device? Disclaimer: I am super lucky to be able to take part in a Sprint Device Ambassador program. The Product Ambassadors love technology. They volunteer to test out all sorts of devices and offer opinions freely to the Community. Each Product Ambassador shares their own opinions of these devices, therefore the information in this post does not necessarily reflect the opinions of Sprint or the device manufacturers. The PA's do not represent the company in an official way, and should not be expected to respond to Community members in an official capacity. My opinions are my own. I am a Device Ambassador and Blogger... I am not a Corporate or Device Manufacturer spokesperson.